If you are a follower of this blog, you probably know by now that I am a big fan of Bible studies published by NavPress. Although I get the study books for free, it is such a pleasure to go through them and write my reviews. 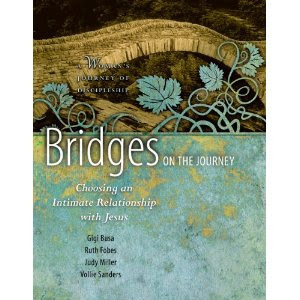 Bridges on the Journey does not disappoint. While the study appears to be basic and foundational to someone who has been walking with the Lord for a long time, it asks really hard questions that require the reader to stop all distractions and truly look into her deepest heart issues in approaching spiritual disciplines. In my opinion, it was exactly what I needed. It was through Bridges on the Journey that I found new excitement in getting up at 5 in the morning, playing my favorite worship song, reading, and writing my heartfelt love letters to my Father. My recent transition to Nashville has been quite an adjustment; and this study was instrumental in keeping my sanity (due to homesickness) intact. The only that will make this study better? Going through this study with other women who are hungry to re-establish her sense of self-awareness in terms of communicating with God. I personally find it difficult to not have someone to do a personal study with from a discipleship standpoint. However, I am filled with joy knowing that this book helped me lock-in my intimacy with Jesus in such a crazy personal season. Disclosure of Material Connection: I received this book free from NavPress as part of their Blogger Review Program. I was not required to write a positive review. The opinions I have expressed are my own. I am disclosing this in accordance with the Federal Trade Commision's 16 CFR, Part 255: "Guides Concerning the Use of Endorsements and Testimonials in Advertising."